Things are getting worse by the minute at the Harriers with a manager under seige from an, understandably, upset fanbase and a team that proved once more that they are not proud of the famous red shirt and are not fit to wear it. Having only just managed to gain a point at Cambridge following a terrible home defeat to Tamworth on the previous Saturday that earned the wrath of manager Mark Yates, they then turned in yet another abysmal performance at York City on the Saturday just gone and earned yet another lambasting from a manager with one eye on his P45. We had just two shots on target at York and both those came from a defender, Mark Creighton. Yet again our forwards failed to get a look in and without a decent supply from midfield or from out on the flanks they are never likely to. Defensively we seem quite strong but it was a defensive error that let Clayton Donaldson in to score for City after two experienced defenders were caught out ball watching. One of those defenders failed to re-appear for the second half and now Jeff Kenna is also doubtful for the visit of Southport tomorrow evening. Also in doubt is Jamie McClen, again, and word is that Dean Sturridges' injury is now going to take two months longer to heal than the original four weeks mooted. It seems that the fans of QPR and the Wolves were correct when they said he would always be out injured. I can't see there being any real surprises with the starting line-up tomorrow with only Simon Russell and Jake Sedgemore possibly starting. There will almost certainly be no dropping of favoured players like Harkness and Whitehead and it's equally certain that there will be no place for young Scott Eaton on the bench. Southport visit us on the back of a very good win at home to Crawley Town on Saturday with two goals from Dino Maamria in their 3-1 win. Then again in their previous game, away to Grays, they lost out 4-0. They've added another striker to their squad this week with the arrival of Nigerian, Awen Douglas. Douglas was previously on trial with Brentford and Derby County but the tall striker is not match fit yet and will probably start on the bench. In the sick room are Carl Baker (hip), Joe Fowler (appendix) and Paul Martin (back injury). James Olsen returned to training this week after injury and also will start from the bench. With two ex Harriers working away in the background at Haig Avenue, Mike Marsh and John Durnin, there should be a warm welcome at Aggborough for these two. 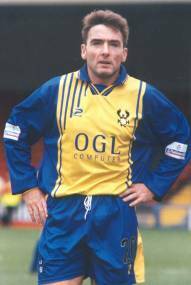 Marsh is held in high esteem by all Harriers fans after he helped to mould the side that won promotion to the Football League in 2000 and Durnin scored 9 goals in 32 appearances for us. How we could do with these two playing for us now. Bevan, S Taylor, Harkness, Kenna, Haworth, Creighton, Whitehead, McGrath, Sedgemore, Hurren, Russell, Penn, Reynolds, Blackwood, Eaton, McClen, B Taylor, Smikle, Christie, Sturridge, White. Robinson, Bagnall, Harrison, Lane, Hoolickin, Powell, Lee, Boyd, Baker, Blakeman, Gray, Maamria, Olsen, Booth, Rowland, Martin, Smith, Jackson, Fowler, Clancy, Barry, Douglas, Bromilow, Owens, Marsh.